The Bakhchisaray Khan's palace bears the title of the main attractions of the Museum of history and culture of the Crimean Tatars. It was built as a family estate by the Giray dynasty, the rulers of the Crimean Khanate. The Khan's Palace was for many centuries the center of cultural, political and spiritual life of the Crimean Tatars. The palace is original and in that it has no solid architectural manners, as built by craftsmen from different countries; Turkey, Italy, Iran, Russia and Ukraine. Extant buildings are located around the perimeter of the spacious central courtyard. The portal iron doors, one of the oldest elements of the palace, perfectly preserved in one of the courtyards. The following are the women's quarters. The female part of the palace, the harem, where his wife's lived, concubines and female relatives of the Khan, located in the main courtyard. Bink Khan Mosque Jami-placed in the main square. To it fits the family burial graveyard. Unfortunately the Khan's Palace was not preserved until today exactly as it was built. In 1736 the palace was captured by the troops of General Munnich and then burned. However, after that it was restored and it became much more luxurious than ever. After the annexation of the Crimean peninsula by Katharina the Russian Emperor's family often stopped here and to each of their arrivals there were made alterations and minor repairs, which eventually led to the fact that the palace has lost its original oriental flavor. In the last century in the palace was made large restorations, buildings have been restored to the most original form. "The Fountain of Bakhchisarai" (popularly tears fountain), located on the territory of the palace at the Fountain Courtyard. This fountain is also at the Vorontsov Palace. In the palace there is a sauna complex Sary Guzel, Art Museum, Exhibition guns, Museum of History and Culture of the Crimean Tatars. This palace is now (after April 2014) part of the Bakhchisaray Historical and Cultural State Reserve and is now a museum complex. Currently, the procedure is carried out of the museum complex entry in the list of UNESCO World Heritage Site. Bakhchisaray Khan's Palace belongs to the cultural heritage of the Crimea. Kozak Travel The Khan's Palace or Hansaray is located in the town of Bakhchysarai, Crimea. It was built in the 16th century and became home to a succession of Crimean Khans. The walled enclosure contains a mosque, a harem, a cemetery, living quarters and gardens. The palace interior has been decorated to appear lived in and reflects the traditional 16th-century Crimean Tatar style. It is one of the best known Muslim palaces found in Europe, alongside Topkapı Palace, Dolmabahçe Palace, Yıldız Palace, Aynalıkavak Palace, Edirne Palace, Çırağan Palace in Turkey and the Alhambra in Spain. The city of Bakhchisaray and the palace were commissioned by the Crimean Khan dynasty, who moved their capital here from Salaçıq in the first half of the 16th century. The palace's complex design and minarets were constructed in the 16th century by Ottoman, Persian and Italian architects. Later damages required partial reconstruction, but the structure still has a resemblance to its original form. Some buildings currently in the palace were attached later, while some of the original buildings could not stand past the 18th century Bakhchisaray Fountain One courtyard contains a small fountain whose sad story so moved the Russian writer Alexander Pushkin when he visited it that he wrote a long narrative poem titled "The Fountain of Bakhchisaray". Fountain of Tears Bakhchisaray Fountain or Fountain of Tears is a real case of life imitating art. The fountain is known as the embodiment of love of one of the last Crimean Khans, Qırım Giray Khan for his young wife, and his grief after her early death. The Khan was said to have fallen in love with this Polish girl in his harem. Despite his battle-hardened harshness, he was grievous and wept when she died, astonishing all those who knew him. He commissioned a marble fountain to be made, so that the rock would weep, like him, forever. Originally placed by the young woman's tomb in a restful garden, the fountain was transferred to its current location in the Ambassadors' courtyard after Catherine II ordered the annexation of the Crimean territory. Pushkin's verses are credited in part for ensuring the survival of the palace itself to date. The Big Khan Mosque Minaret Main article: Big Khan Mosque The Big Khan Mosque (Crimean Tatar: Büyük Han Cami) is located on the Palace Square to the east of the northern gate. It is one of the largest mosques in the Crimea and one of the first buildings of the Khan's palace. The mosque was built in 1532 by Sahib I Giray and bore his name in the 17th century. The mosque consists of a three-aisle square prayer hall covered with a hipped roof, a narthex and porticos facing east and west. Two symmetrical octagonal minarets rise through the porticos; they are twenty-eight meters high and have conical caps and finials. A domed ablution kiosk of square shape is attached to the northeastern corner of the mosque. It is believed that a madrasah built by Khan Arslan Giray in 1750 used to adjoin the eastern wall. The mosque is entered from a portal facing north. Inside, a balcony is attached to three of the four walls, part of which is sectioned off for the Khan's lodge. Scholars argue that the mosque was originally roofed with domes of various sizes. In 1736 the mosque was damaged by fire and later restored during the reign of Khan Selameta Giray. Small Khan Mosque The Small Khan Mosque (Crimean Tatar: Kiçik Han Cami) is located in the main building and was designed for members of the Khan's family and important dignitaries. Construction of the small mosque dates back to the 16th century, and paintings in the mosque are from the 17th and 18th centuries Mihrab in the Small Mosque In the south wall is the mihrab, the upper part of which is cut seven ornamented belts, symbolizing the seven levels of heaven. Above the mihrab is a stained glass window, which shows the seal of Suleiman (hexagram). On the walls of the small mosque are scratched images of boats with sails, horses and horsemen. Bakhchysarai (Ukrainian: Бахчисарáй; Crimean Tatar: Bağçasaray; Russian: Бахчисарáй; Turkish: Bahçesaray; Persian: باغچه سرای‎‎) is a city in central Crimea, a territory recognized by a majority of countries as part of Ukraine and incorporated by Russia as the Republic of Crimea. It is the administrative center of the Bakhchysarai Raion (district), as well as the former capital of the Crimean Khanate. 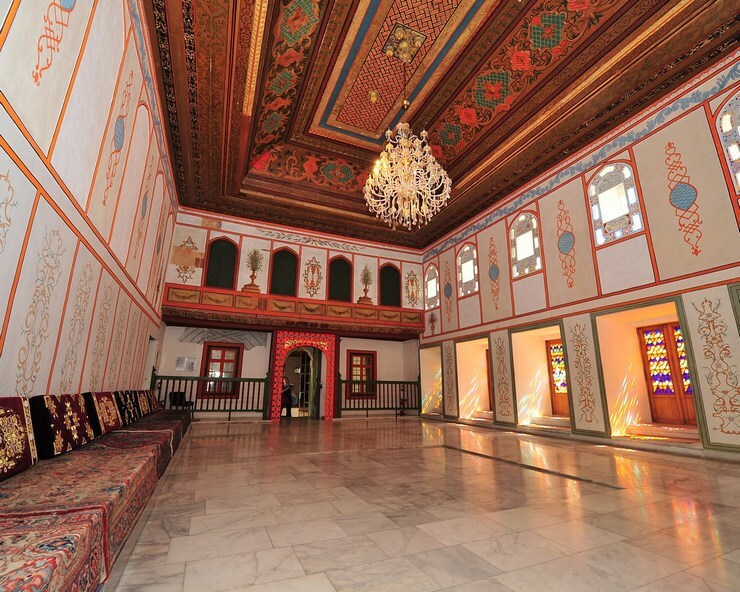 Its main landmark is Hansaray, the only extant palace of the Crimean Khans, currently opened to tourists as a museum. Population: 27,448 (2014 Census) Located in a narrow valley of the Çürük Suv river, the first artifacts of human presence in the valley date from the Mesolithic period. Settlements existed in the valley since Late Antiquity. The founding of Bakhchisaray was preceded by the Qırq Yer fortress (modern Çufut Qale), Salaçıq, and Eski Yurt — these are incorporated into the urban area of modern Bakhchisaray. Bakhchysarai, first mentioned 1502, was established as the new khan's residence by the Crimean Khan Sahib I Giray in 1532. Since then, it was the capital of the Crimean Khanate and the center of political and cultural life of the Crimean Tatar people. After several wars with Russia from 1737 when Burkhard Christoph von Münnich burnt down the capital of the Khanate and the annexation of the Crimean Khanate by the Russian Empire in 1783, it was turned into an ordinary town, having lost administrative significance. However, it remained the cultural center of the Crimean Tatars until the Sürgün (deportation on 18 May 1944). Name and associations Spellings of the town's name in different languages include: original Crimean Tatar: Bağçasaray, Turkish: Bahçesaray, Russian: Бахчисарай - Bakhchisaray, and Ukrainian: Бахчисарай - Bakhchysaray. The name comes from Persian باغچه سرای bāghche-sarāy which means the Garden Palace. In Crimean Tatar, bağça means "garden" and saray means "palace". Russian speakers associate the town with the Romantic connotations of Alexander Pushkin's poem The Fountain of Bakhchisaray (1822). Adam Mickiewicz dedicated some of the finest poems in his Crimean Sonnets (1825) to the landmarks of Bakhchisaray. An asteroid, 3242 Bakhchisaraj, discovered by Soviet astronomer Nikolai Stepanovich Chernykh in 1979, takes its name after the town. Attractions Famous attractions within or near Bakhchysarai are: Eski Yurt Chufut-Kale Khan's Palace Orta Juma Jami Tahtali-Jami Mosque Uspensky Cave Monastery Zincirli Madrasa There is a network of well marked hiking trails around the town. All the main attractions are connected with red-marked trail. Since 2011 thanks to the support of the Czech Government and USAID the Tourist information centre has been working. Demographics Historical Populations Year	Pop. ±% 1930	10,450	— 1939	10,891	+4.2% 1989	25,363	+132.9% 2006	26,400	+4.1% 2011	26,215	−0.7% Source: In 1930 the population of the city was 10,450. The ethnic groups represented were 7,420 Crimean Tatars, 1,850 Russians, 315 Jews, 205 Greeks, 185 Ukrainians, 50 Germans, 30 Armenians, 30 Bulgarians, and 365 others. International relations See also: List of twin towns and sister cities in Ukraine Twin towns – Sister cities Bakhchysarai is twinned with: Turkey Bursa, Turkey See also Bakhchisaray Palace References Jump up ^ Khan Palace in Bakhchisaray Jump up ^ Russian Federal State Statistics Service (2014). "Таблица 1.3. Численность населения Крымского федерального округа, городских округов, муниципальных районов, городских и сельских поселений" [Table 1.3. Population of Crimean Federal District, Its Urban Okrugs, Municipal Districts, Urban and Rural Settlements]. Федеральное статистическое наблюдение «Перепись населения в Крымском федеральном округе». ("Population Census in Crimean Federal District" Federal Statistical Examination) (in Russian). Federal State Statistics Service. Retrieved January 4, 2016. Jump up ^ Dictionary of Minor Planet Names - p.269 Jump up ^ "Kardeş Şehirler". Bursa Büyükşehir Belediyesi Basın Koordinasyon Merkez. Tüm Hakları Saklıdır. Retrieved 2013-07-27. External links Wikivoyage has a travel guide for Bakhchysarai. Wikimedia Commons has media related to Bakhchisaray. Wikisource has the text of the 1911 Encyclopædia Britannica article Bakhchi-sarai. Official site of the Palace (English)/Ukrainia/Russian History and monuments of Bakhchisaray (Russian) The murder of the Jews of Bakhchysarai during World War II, at Yad Vashem website.